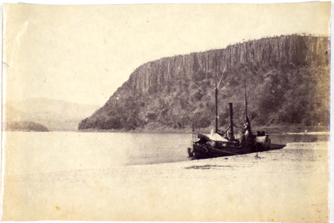 This photo from the earliest days of photography in 1860 shows the ‘Ma Robert’, Dr Livingstone’s ship on the second Zambesi expedition of, photographed on the Zambesi at Lupata, Africa. It was captured by Livingstone’s colleague Edinburgh doctor Sir John Kirk. The date is likely as being around 1860. The Zambesi Expedition (1858-1864), which was known by many different names at the time, was an official exploration funded by the British Foreign Office. Its main purposes were to catalogue the natural resources of the Zambezi River area in order to identify raw materials for British industry and to promote commercial markets and civilization to supplant the slave trade. It was not known whether the Zambezi was navigable in its whole length, although Livingstone, in his enthusiasm, presumed it was. It turned out not to be so, the Kebrabasa rapids forming a formidable natural obstacle. The expedition was led by David Livingstone who was appointed H.M. Consul at Quelimane. He was accompanied by John Kirk, Charles Meller, Thomas Baines, Richard Thornton and Charles Livingstone. 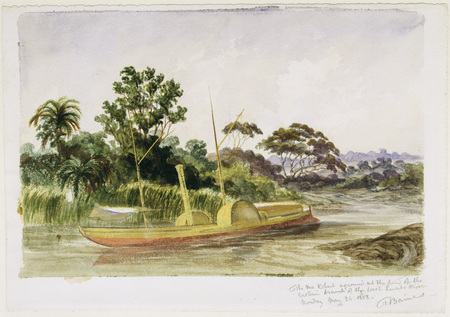 The Expedition’s ship, HMS Pearl, arrived at the Zambezi delta on 14 May 1858 carrying the parts of the exploratory vessel, the Ma-Robert. The Expedition spent most of its six years along the final 250 miles of the Zambezi and the lower 130 miles of its northern tributary the Shire River (pronounced ‘shee-ray’). Portugal claimed colonial sovereignty over the region but in practice only small areas were under that country’s control. In many places tribal and Portuguese clan control prevailed. Warfare was endemic. Malarial fevers plagued low-lying marshy areas. Tsetse fly seemed to be everywhere. Livingstone was unhappy with Thornton, the geologist, who was dismissed. Baines, the artist, was suspected of stealing from the stores (which he denied) and was also dismissed. poor engaged in cotton spinning and weaving. Although the UMCA was not part of the Expedition the missionaries turned to Livingstone for advice and inspiration. In May and June 1861 Bishop Mackenzie and the UMCA were taken to Magomero in the Shire highlands to set up a mission station. Livingstone, Kirk and Charles Livingstone returned to Lake Nyassa (now Lake Malawi) to explore. The trip lasted from early August until November 1861 and failed to map the area satisfactorily. Had this been done controversies about the source of the Nile would have been more easily resolved. Kirk made an important collection of mussel shells. The following year, 1862, proved no better. Several members of UMCA, including Bishop Mackenzie, died of fever. By 1863 the Expedition suffered insuperable navigational difficulties. The UMCA was scarcely able to feed itself. It was clear recall to Britain would take place. Kirk and Charles Livingstone left for Britain on 19 May. Livingstone went exploring. The UMCA wound up its operations and moved to Zanzibar. Livingstone left in January 1864 and took the Pioneer and Lady Nyassa to Zanzibar. In April he captained the Lady Nyassa to Bombay to sell her but was unsuccessful. He returned to London in July. The Expedition had failed in its major aims. But botanical specimens were collected and sent to Kew Gardens and zoological specimens were sent to the British Museum of Natural History. The Victorian spelling was Zambesi. The alternative, Zambezi, is more common today.